Some glaciers on Asia's Karakoram mountains are defying the global trend and getting thicker, say researchers. A French team used satellite data to show that glaciers in part of the Karakoram range, to the west of the Himalayan region, are putting on mass. The reason is unclear, as glaciers in other parts of the Himalayas are losing mass - which also is the global trend. The region's glaciers are poorly studied, yet provide a vital water source for more than a billion people. The response of Himalayan glaciers to global warming has been a hot topic ever since the 2007 report of the Intergovernmental Panel on Climate Change (IPCC), which contained the erroneous claim that ice from most of the region could disappear by 2035. Although often regarded as part of the Himalayas, the Karakoram range is technically a separate chain that includes K2, the world's second-highest peak. Much of the region is inaccessible, and there has been a general recognition that observations need to be stepped up in order to clarify what is going on. The French scientists, from the National Centre for Scientific Research and the University of Grenoble, compared two models of land surface elevation derived from satellite observations, for 1999 and 2008, and report their findings in the Nature Geoscience journal . The method has been used before in other mountain ranges, but it is not as straightforward as it might sound. "It's not been used more because these elevation models are quite difficult to acquire - you need clear sky conditions and reduced snow cover," said lead researcher Julie Gardelle. Other factors that can change the height of the ice surface, other than changes to the ice itself, also need to be accounted for. Having done all these calculations, the team found that between 1999 and 2008 the mass of the glaciers in this 5,615 sq km (2,168 sq miles) region of the Karakoram increased marginally, although there were wide variations between individual glaciers. Why this should be is not clear, though it is well known from studies in other parts of the world that climate change can cause extra precipitation into cold regions which, if they are cold enough, gets added to the existing mass of ice. "We don't really know the reason," Ms Gardelle told BBC News. "Right now we believe that it could be due to a very specific regional climate over Karakoram because there have been meteorological measurements showing increased winter precipitation; but that's just a guess at this stage." 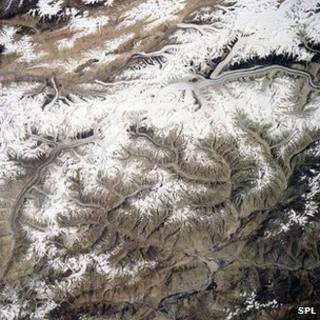 Whatever the region, it is clear that the trend contrasts with other parts of the wider Himalayas-Hindu Kush region, home to an estimated 210 million people and where glaciers act as fresh water stores for about 1.3 billion living in river basins below. Late last year, the Kathmandu-based International Centre for Integrated Mountain Development (Icimod) released data showing that across 10 regularly studied glaciers, the rate of ice loss had doubled since the 1980s. However, it also made clear just how sparse data is from the region, finding only these 10 intensively studied glaciers among a total of more than 54,000. Measurements by the GRACE satellite mission, which detects minuscule variations in the Earth's gravitational pull, have also shown a net loss of mass across the whole region. Graham Cogley, the scientist from Trent University in Ontario, Canada, who first publicly questioned the IPCC's 2035 figure, comments in Nature that reconciling the different mass loss figures found by different methods of study "will keep glaciologists busy for some time".